Within TeleTracker Online, sales tax is broken up into two (2) different parts: (1) Sales Tax Item; used to set up your company’s various types of sales tax, such as state, city, and county, and (2) Sales Tax Code; used to combine sales tax items. To access Sales Tax Master Files from the menu bar of the main TeleTracker Online screen, click Master Files > Sales Tax, and then choose either Items or Codes. To create a new Sales Tax Item or Code, click on New button located on the toolbar. 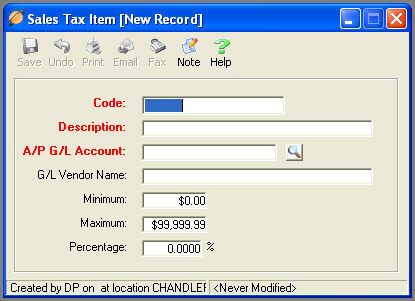 To open an existing Sales Tax Item or Code, select it from the corresponding Master File list and click the Open button. Code : This field is the unique name used to identify each individual Sales Tax Item. Description : This field is used to further describe your Sales Tax Item. A/P G/L Account : This field is required if you are Synchronizing with QuickBooks. If you are NOT synchronizing with QuickBooks populate this field with the provided default account: 9999-TELETRACKER SUSPENSE GL CODE. Please visit the QuickBooks help file for further information regarding your General Ledger Accounts and synchronizing with QuickBooks. Minimum and Maximum : These fields apply only to those states with minimum and maximum taxing requirements. Percentage : This field defines the Sales Tax Item’s tax rate. Enter the rate as an actual percentage. Example: 5% would be entered as 5.0000%. Tax Code : This field is the unique name used to identify each individual Sales Tax Code. Description : This field is used to further describe your Sales Tax Code. Valid From and Valid To : These dates are used to define tax code expiration dates. If tax code expiration dates do not apply to your company, you may populate the <Valid To> date with ‘1/01/9999’. Sales Tax Items : The final step is to incorporate the individual Sales Tax Items into the Sales Tax Code you have just created. 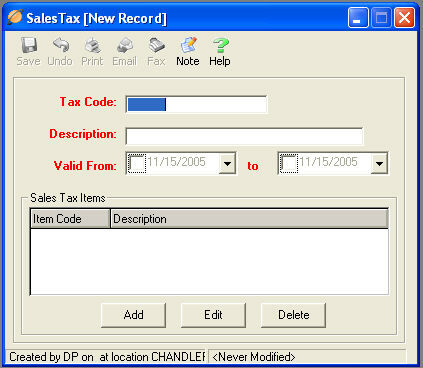 A dd the appropriate Sales Tax Items into the code by clicking the Add button. Any number of Sales Tax Items may be incorporated into a single Sales Tax Code. Carefully defining your Sales Tax Items and Codes will insure the accurate reporting and payment of your company’s sales taxes.